I consider it a great privilege to be amongst you all in this beautiful temple city of Bhubaneswar, having a rich heritage and culture, to deliver the Second Convocation Address of the Indian Institute of Technology (IIT), Bhubaneswar. IIT Bhubaneswar is one of the eight new IITs established during the previous Five Year Plan period. It has spiritedly overcome the hurdles that are associated with a nascent academic institution. It has expanded its academic programme, undeterred by paucity of physical infrastructure. From 94 students in three under-graduate programmes when it started five years ago, it today has more than 750 students engaged in 14 programmes. Its educational philosophy - integration of academic thought rather than creation of regimented disciplines - is laudable. It recognizes that end-to-end design of today’s complex systems cannot be dealt only with skills imparted by a single discipline. It emphasizes the need for students to learn from a wider knowledge spectrum and acquire inter-disciplinary capabilities. IIT Bhubaneswar has also responded positively to our country’s need to have globally competitive but locally relevant engineering institutes. To formulate academic and research framework for issues of local priority, it opened two Schools in 2011, namely Earth, Ocean and Climate Sciences, and Minerals, Metallurgical and Materials Engineering. We have a vision to take India into the league of leading nations. This is possible only if we have highly capable engineers, scientists, doctors, academicians and other intellectuals. A strong academic foundation is the basis for producing such talented and trained people. Our efforts at expanding higher education infrastructure in India have yielded positive results. Even then, on account of lack of quality, very few academic institutions can claim global reckoning. As per an international ranking, there is not a single Indian university, including the IITs, amongst the top two hundred universities in the world. Leading universities of the West and universities even in countries like China, Hong Kong, Taiwan, Brazil, Mexico, South Africa, Malaysia and Saudi Arabia are ranked higher than any Indian institution. In the past, for about eighteen hundred years beginning Sixth Century BC, we had an unbeatable higher education system represented by universities like Takshashila, Nalanda, Vikramashila, Valabhi, Somapura and Odantapuri. They were a magnet for knowledge seekers from distant places. But today, we languish behind many nations. A world class higher education system is marked by excellence in functioning. Improvement in our academic system calls for innovative changes. Our examination system must incorporate modern methods of evaluation. Top quality teachers must be recruited. A spirit of competition amongst universities must be infused. Academic regulation must be streamlined to create a more flexible, transparent and student friendly educational system. Innovation is an important cog in the wheel of development. Progress is today technology-led. In India, research and innovation does not adequately portray the inherent ingenuity of the people. A Science, Technology and Innovation Policy was adopted this year to push innovation frontiers by kindling the creative energy of our population. The mantle to make this policy successful and unleash our inventiveness lies on our higher academic institutions. It is the bounden duty of all our universities and engineering institutions to put research at the forefront of their academic efforts. I am happy that IIT Bhubaneswar has done exactly that. 129 students are today enrolled in its PhD programmes in the pursuit of cutting edge research in various fields. This Institute has tie ups with reputed national research and development organizations. It has also bagged thirteen industrial consultancy projects. It has initiated measures to nurture innovation and creativity in its students, scholars and faculty members. It has adopted a curriculum this year, which encourages and supports research across all under-graduate and post-graduate programmes. To foster creativity, it has instituted an award for the most innovative project carried out by the final year students of B.Tech programmes. I am most certain that this IIT will be able to generously contribute to our country’s technological developments. History bears testimony to the fact that intellectual cooperation between individuals and nations have led to significant enhancement of human understanding and knowledge. Early development in Mathematics and Medicine has the imprint of several civilizations – Indian, Greek, Roman and West Asian. Scientific advances in the middle ages owe a great deal to the contribution of scientists like Copernicus, Galileo, Kepler and Newton. This pragmatism - about strong academic networks benefitting collaborators through exchange of ideas and latest developments - holds greater relevance today. Academic institutions must forge knowledge partnerships, both within and outside the country. I am glad to learn that IIT Bhubaneswar has been proactive in seeking global academic cooperation. It has initiated faculty exchange programmes with renowned universities in US, UK and Canada. 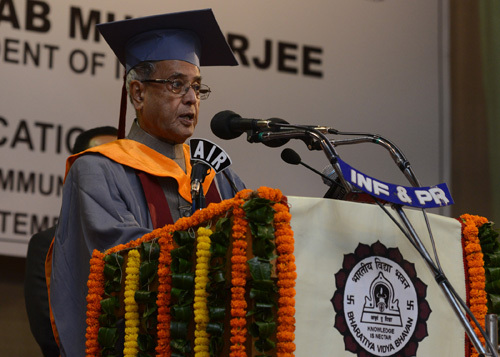 I am confident of this programme setting global benchmarks of engineering education in this young Institute. IITs are recognized the world over for their academic excellence. Their alumni have made them and more so our country proud, whichever profession they chose to pursue - be it science or engineering, teaching or research, entrepreneurship or corporate world, or public service. They have earned respect globally for their intellect and professionalism. As a product of IIT, you have to live up to this expectation. I am confident that each one of you will excel in your chosen field, and each one of you will lead a life of relative comfort. At the altar of success, never forget to retain a sense of empathy for those countrymen of yours who are still burdened with hunger, poverty, deprivation, disease and backwardness. I am told that during your Institute’s Foundation Stone Laying Ceremony in February 2009, a sea of humanity- mostly common man- had gathered. They came to see a dream realized; a long cherished aspiration of the people of this State fulfilled. Most of them did not have any direct connection with this Institute. They only held an unstated expectation in their minds - that of greater progress and well-being. It is time for you to help realize the hopes and aspirations of your compatriots. You have toiled hard for your degree. You have surmounted all the difficult academic challenges. You have competed with the best. As you leave the portals of your alma mater today, remember that cooperation is equally important in life as competition. In your professional life, solving tasks would require many minds to come together. Learn to be a team player. Develop tolerance for multiple viewpoints. Be humble. Respect and understand your colleagues. Make truth, knowledge and hard work your partners in life. Knowledge is limitless. Keep your mind always open to gather more knowledge, for in the words of Benjamin Franklin which I quote: "An investment in knowledge pays the best interest” (unquote). I wish you all the very best in life. I also wish the management and faculty of IIT Bhubaneswar greater success in their endeavours.